Well done ladies, you were spot on Caroline, I know it's a sculpture but the horse Looks alive, just look into his eyes, We always say our Arabians are a work of art and I think that this ladies work shows them in there true glory. Marylin can you help? And was it modelled on a living horse? The original sculpture was shown at Ascot in about 1982 - not cast until many, many years later. I have several of PduB's Rydal models, as well as some of the Frankline Mint pieces but the latter are not good representations of the quality of her work - very badly finished in many cases. Like most FM issues they haven't held value on the secondary market and can be picked up fairly cheaply on ebay! The first Pamela du Boulay bronzes I saw were at Jean Kirch's house, they were magnificent. I then tried to buy one for myself sadly with no success. I have some of Karen Kasper and Judy Nordquist's bronzes but would love to have a Du Boulay if anyone can be of help in locating one? Pamela is a dear friend of mine and until December was a close neighbour. She has some superb pieces in her own home but sadly lost the will to work on any sculptures for quite a long time after the death of her husband. However, she was really getting back into the swing of it last year and long may it continue, her work is unique. check out www.animalartistry.co.uk and look for Garretts of Hereford on the bottom left side of home page. Underneath that you will see Pamela Du Boulay. available in ceramic resin and china. Many thanks for all the input, also to Pat for that Link really good. What can you tell us about Muscat? Really enjoying this thread. Looked at the web site and the arab with the golden saddle is fantastic, wish I could aford to buy one. OOH I knew that one Bob but it had been sussed before I came on! that Jane is just too goood! Bob the reason I have not been on my scype is because I need a new Mic, as soon as I get one you will hear from me ! He was born on your turf .. or sort of. You�ll be pleased to know that I spoke to Pam last night and she is busy working on a new project but it�s not equestrian related I�m afraid. To those who are interested, the secret of her success is being a gifted horsewoman and spending many years studying equine and animal anatomy in great detail. Fortunately, it�s a lesson she taught me well but it does spoil you for looking at some other artwork � you can see some amazing anatomical errors and impossibilities! He was born in 1975, Sire Russian, Dam mainly Crabbet/Polish. Was he bred by the Backhouses on Horsey Island? Have a horse in mind but his name escapes me! This is a toughie!! .......... A bay stallion, connections to Horsey Island/Thriplow Farms. Has to be by Nasmeshnik I suppose. I said BY Nasmeshnik!! But that's no help to me even if he was. Maybe you meant not by Nasmeshnik? K, it has to be one of the Red something's. But which one? Hmmmmm????????? Y'all got the books - you can figure it out I'm sure. Also, his dam was definitely not a war horse. 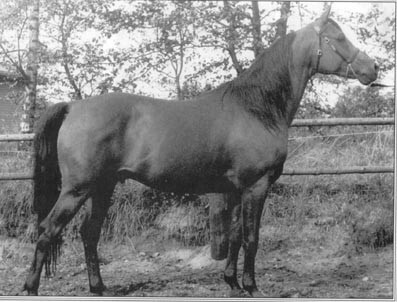 Pacific (Nasmeshnik x Peace) was exported to Denmark in 75 where, according to the Danish stud book, he sired 67 foals. There are some others that were foled in other countries. He was bought by Harry and Jean Laursen and stayed with them until he died, siring a dynasty of broodmares and quality riding horses. He was shown once at the Danish National Show in 1980 where he got a gold medal and was Stallion Champion. You lot are Tooooooooooooo Big for your boots. Why is this Horse unique in the whole of the HORSE WORLD ?